Dell Technologies Forum is a one-day event featuring all seven of Dell’s technologies in one place. The San Francisco Forum had Pat Gelsinger keynote. Hearing Pat on stage, I couldn’t help but think about all the potential our members have. Listening to the future of VMware at events like this, announcements at VMworld, and articles from tech magazines tells me we, the vAdmin, are poised for great things. Even so, that future won't be realized without effort. VMworld had vSphere getting main stage attention, which was awesome for us to reflect on. There is a lot happening right now in the VMware world: NSX, vSAN, Workspace One, etc.…But this forum was a great opportunity to get back to the roots of what VMUG members have built a career on. 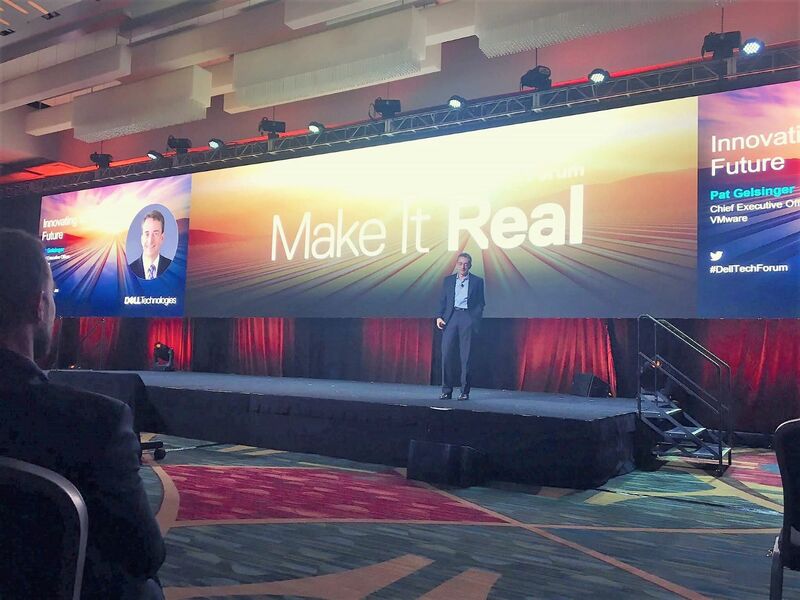 vSphere’s recognition by the broader industry is huge: vSphere was a foundational building block for us, and now it is poised to take us to the next level. I even saw a shirt with "it all begins with vSphere" on the front. More than just a cool slogan for a shirt, that truth is a roadmap for leveling up your career. We, the collective group of vAdmins, have the advantage of knowing a skill that is the base for the SDDC, the hybrid cloud, and the future. Learn the technology and upgrade with vSphere. Use VMUG Advantage, test/dev, home labs, and continually work to upgrade your own personal skill set as technology advances. Being a vSphere user has served us well up to this point, but it will NOT be your career the next decade. Be the thought leader in your company. You already have knowledge about hypervisor, so learn to build on that. Go beyond the benefits virtualization has for IT and imagine all the ways it can enable your business to exceed expectations. The existing technology is powerful, fun, and a testament to innovation. Although the business unit doesn't share our excitement for the tech itself, it does share the excitement of how it can enable the business unit. For each stakeholder, delivering products and services to market quicker, more efficiently, and securely is a shared reason for excitement. Get out of our comfort zone. Learning new technology is the first step but learning how to bring your unique skill sets and understanding of the industry to a broader base is critical. You are not just a vAdmin anymore: you are an IT superhero well-versed in both IT and business, and you are here to lead your company in its digital transformation. I challenge all vAdmins to level up and lead the charge in your company. YOU have the power to empower the IT department of the future that will transform your job, your role in the company, and the company itself. Be the innovation you want to see in your company, your career, and your world! Find me online or in person and tell me how this is working for you, and how VMUG can help make this a reality.